The U.S. economy contracted more than economists initially thought in the first quarter, with real GDP down 2.9 percent at the annual rate. The lower revision was “much worse” than the previous estimate of a 1 percent drop, National Association of Manufacturers chief economist Chad Moutray said. The sluggishness was likely prompted by reasons beyond weather. However, the real GDP data also point to a possible strong rebound in the second quarter, as some manufacturing indicators showed the strongest momentum in four years. 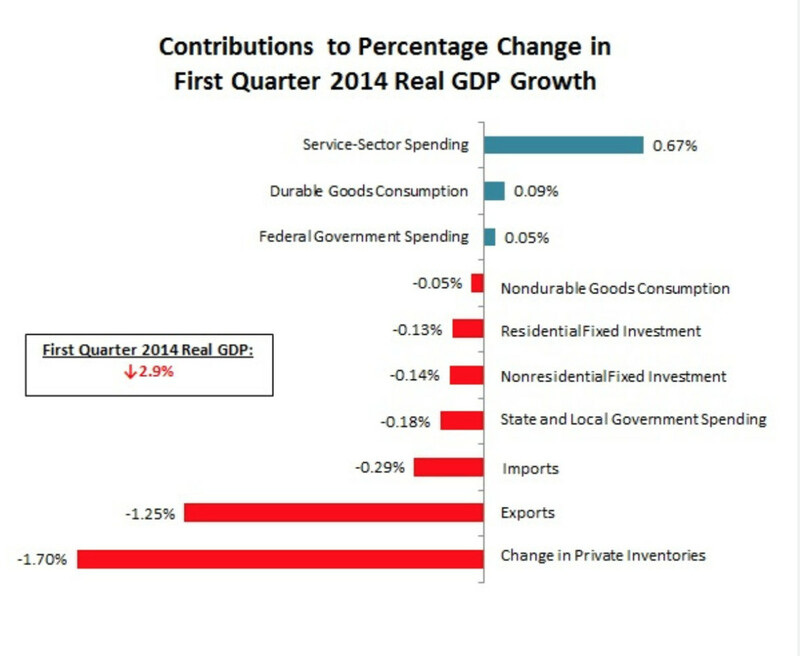 Decreased inventory spending and weaker goods exports accounted for much of the decline in output, but consumer spending on services also increased at a slower pace than earlier reports suggested, contributing to the latest revision. Fixed investment and government spending were also drags on growth, Moutray wrote in a recent report. “Overall, the data confirm that economic activity started 2014 on a disappointing note, but they also suggest that this softness went beyond weather-related slowdowns,”Moutray wrote. However, Moutray predicted that inventory spending is likely to pick up as more firms restock their shelves. Many of the measures of health for the manufacturing sector remain encouraging, Moutray said. The Markit Flash U.S. Manufacturing Purchasing Managers’Index (PMI) increased from 56.4 in May to 57.5 in June. “This was its fastest pace in more than four years, led by strong gains in both new orders and output,”Moutray wrote. Manufacturer sentiment in both China and Japan also stabilized after contractions in previous months. At the same time, manufacturing activity in the Kansas City and Richmond Federal Reserve Bank districts continued to expand, albeit at slower paces than the month before. These two releases were largely consistent with other regional surveys, including those from New York and Philadelphia, showing rebounds since the winter months. But not all of the manufacturing news was positive. Durable goods orders fell 1 percent in May, reflecting weaker-than-anticipated growth for the sector. Much of that decline stemmed from reduced non-defense aircraft and parts sales, although the broader data were also mixed. Meanwhile, European manufacturing activity continued to decelerate. Moutray expects employment growth to be similar to May when jobless numbers are issued, with a consensus estimate of 210,000 additional nonfarm payroll workers and around 10,000 or so net new manufacturing employees.